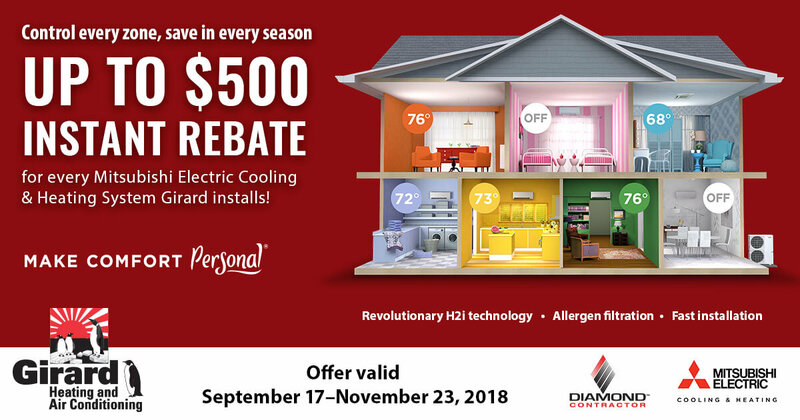 We are excited to announce that the Mitsubishi Instant Rebate program is again available to customers who purchase a qualified Mitsubishi Electric Cooling & Heating System between Sept. 17 and Nov. 23 and have Girard Heating and Air Conditioning perform the system installation by Dec. 7. This is a fantastic time to install one of these systems—ahead of cooler weather in the fall and before a winter cold snap—especially if you have an older home. Mitsubishi systems heat your home while improving indoor air quality and they can be quickly installed by our team. Mitsubishi Electric is the industry leader in split-ductless air-conditioning technology. It delivers the ultimate in comfort control for your home or office through quiet, easy-to-use, and energy-efficient operation of its systems. Mitsubishi Electric’s advanced climate control systems enhance customers’ homes and lives. It is also easy to set the desired room temperature with zoned smart-control functionality.